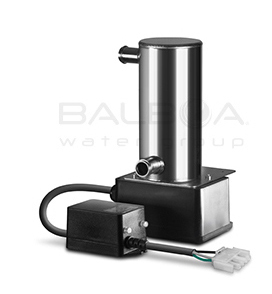 Balboa WAVETEC254™ Sanitation Systems were designed by Balboa, the leader in reliability in spa controls for over 20 years. These compact sanitizers were created specifically to withstand the demanding environment of the hot tub. • UV light deactivates the DNA of harmful microorganisms such as E. Coli, Cryptosporidium, and many others. • UV light destroys 99% of harmful viruses, bacteria, and pathogens without adding to the water any harmful chemicals or smelly, environmental unfriendly gases. • UV light reduces the use of chemical levels, helps eliminate chloramines and the discomfort of skin and eye irritants. • UV light won’t damage equipment as ozone and salt systems can. 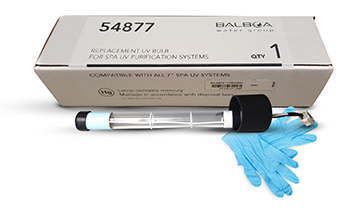 • Powerful Made in USA UV lamp with standard 12,000 hours of service. • UL listed electronic ballast. • Available in 120V and 240V, 50/60Hz. • Has been scientifically tested by third party accredited bio-lab specifically for spa applications. • Has been proven working sanitation method for spas over the years. • The quartz seal mechanism is made of stainless steel – No cracking, no melting, no leaking. • 316L stainless steel with special heat treated housing – No degrading – No melting. • High shock, vibration, and drop resistance. • Super low production and field failure rates. • Small compact unit requires very minimal room for installation. • Built-in mounting bracket - No need for stands and/or clamps. • Easy lamp replacement and quartz tube cleaning. • UL, CUL & TUV Approved.